Suffering from anxiety is unbelievably difficult! More than 40 million adults in the United States have anxiety – many of them suffering silently. In many cases, this feeling of apprehension is what happens when we don’t take care of our basic emotional and physical needs. Whether it is navigating through our daily thoughts, neglecting proper nutrition, or suffering with a chronic anxiety disorder – most people suffer from some kind of apprehension that they can’t quite put their finger on. 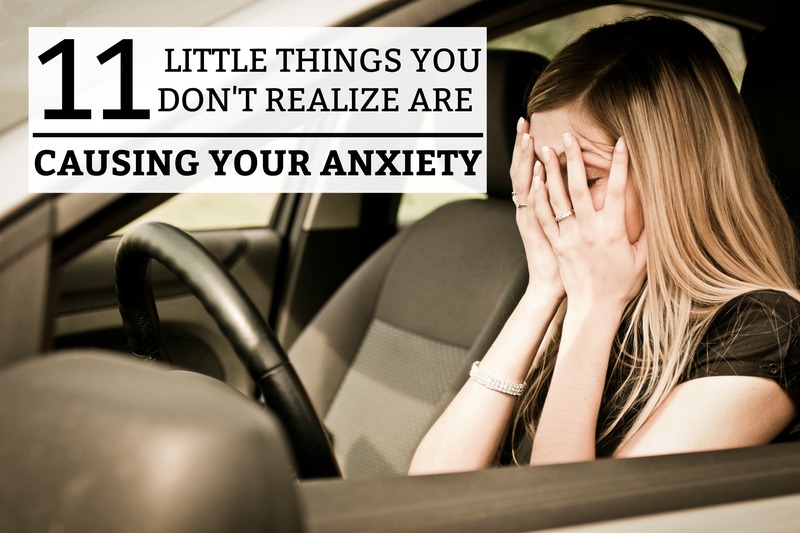 Below are11 little things that you might not realize are actually causing your anxiety! This is a really hard lesson that many people have to go through! What do you do when you know someone is horribly negative – but you don’t want to be mean to them. You must come to a point where you realize that you have zero time for people who are a negative force in your life. I’m not talking about people who just aren’t naturally positive. I’m talking about people who are a toxic & negative force in your life. Think about it! Can you think of someone that always makes you feel depressed and anxious? Do they talk negatively about others, gossip, manipulate, always talk about themselves, make you feel bad about yourself, etc? It’s not worth it! Life is too short. You absolutely need to distance yourself from them. It might feel like a breakup – but from a family member or “friend”. But as time goes by, you’ll feel much more free and happy! You will be better off being able to nurture relationships that are healthy and worthwhile. YES! Believe it or not, having too much time on your hands can actually cause anxiety. When you’re bored or your mind doesn’t have anything to focus on, it often dwells on things that you fear or are unsure about. Have you ever caught yourself thinking about the worst case scenario of something that MIGHT happen in the future? Chances are, it will NEVER happen. But you’ve allowed your mind to wander down a path that leads to anxiety and fear. Instead of allowing yourself to sit around and OVERTHINK situations, do something productive! Accomplish a goal. Maybe this is dance or art lessons. Perhaps a photography class. Whatever you do, just don’t get into the bad habit of allowing your mind to play tricks on you. We live in a fast-paced and stressful world. It is way too easy to get wrapped up in life and skip a meal here and there! In fact, if you are a naturally anxious person, you may actually lose your appetite – making matters worse. If your body has been used to regular meals, skipping a meal can cause your blood sugar levels to drop. If you don’t boost your sugar levels with a snack or meal, it may lead to feelings of anxiety and irritability. Signs of low blood sugar are light-headedness, dizziness, and weakness. MANY people suffer from vitamin or mineral deficiencies, but never know it! Vitamin C, vitamin E, B complex, magnesium, calcium, etc. Nutrient deficiencies can affect your mood and metabolism. My body is magnesium deficient, and I can tell when I haven’t taken my supplements in a while! I feel more stressed, achy, and irritable. Go to your doctor or a naturopath and figure out if you are deficient in anything. It could make a world of difference when it comes to your mental health! …a smell, old song, or even a location. Anything that is linked to a really bad memory or feeling! The smell of your horrible ex’s cologne. The song that reminds you of a really difficult time in your life. Or that place that you once loved, but now hate because a traumatic life experience happened there. In other words, its like a mild case of PTSD! These unconscious cues can be very difficult because they can provoke anxiety and depression. If this is a severe problem for you, you should absolutely seek help from a therapist. You can’t let your past dictate your future – regardless of how difficult it has been. Social Media is made up of things called “click bait”. In other words, advertisement and marketing agencies will do ANYTHING to make you click on their article or post. Is your social media covered with titles like this? If you turn on the nightly news, do you start feeling tense and uneasy? Journalists are trained to report on anything that will gain the public’s attention. USUALLY, this has to do with something that is unsettling, terrifying, sad, or concerning. Human beings are drawn to fear and doubt. If the news is stirring up anxiety, STOP WATCHING IT! Do you find yourself constantly comparing yourself to other people on social media? Or maybe you read the comment section below posts and become overwhelmed with all the haters that are in the world. If this is the way you fill your down-time, you need to stop. The world is full of wonderful people and good news! If you find that you’re getting overwhelmed by either of these things, take a break from it. You may find that your anxiety eases up – as you focus on YOU and your mental health. Did you know that hydration and mood are directly linked? If you aren’t drinking enough water, you may find yourself becoming more angry, confused, and tired. This is a very common (and difficult) trap to fall into! It is so easy to wonder what other’s opinions of you are – and it is completely normal. However, this habit can turn into an unhealthy obsession that can fill you with feelings of uncontrollable anxiety. Stop overthinking things! It will ruin your happiness! You will over-analyze every comment, glance, and whisper. You will questions people’s intentions and mull over facts that may never have happened. Give yourself a break! Your thoughts will either increase your insecurity or increase your confidence. Instead, focus on improving yourself and finding successful ways to be more confident. Trust yourself! You aren’t like anyone else and you do not need to try to meet other’s expectations. Do you find yourself worrying about saving, debt, student loans, or not being able to pay your bills. These are real-life problem that most people go through! If possible, seek professional help from a financial advisor. Getting professional advice from someone who works in the financial industry is incredibly important! They will help to create a plan for you to secure your financial future. Do you hate feeling alone in a room full of strangers – or even people you know, but aren’t comfortable around. Maybe small talk or interacting with people you don’t know triggers your anxiety. You don’t know what to say and start feeling awkward and tense. You are NOT alone! Many people feel this way. To help to ease your worries, try these tips. Learning how to feel more confident in social settings is a great way to help your anxiety. Do you have that voice inside of your head making you doubt yourself? If you listen to that negative & pessimistic voice inside of your mind, you will never see your true potential! You have the ability to take control of your thoughts and fight back! You know the truth about yourself. You are so much stronger than you think! Talk to yourself – out-loud if necessary. Perhaps you can’t turn off that inner voice forever, but you can speak louder than it. If necessary, go to a therapist and seek professional help. You should NEVER have to feel embarrassed to go to a counselor or therapist. You can be taught life-changing ways on fighting that inner voice and living up to your true potential! If you aren’t sure if you have anxiety, here are some signs that you may be suffering from this very common disorder. One in 4 Americans suffer from anxiety! However, many of them are never properly diagnosed or ever seek professional help. You can live a full and happy life, but learning to manage your anxiety is a key factor! I’ve never thought about it before but lack of nurtriants is a definite factor! Thanks for bringing it to light! This is AWESOME!! THANK YOU SINCERELY!